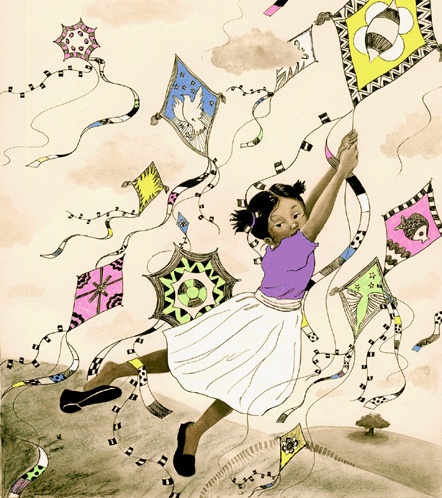 Yesterday, The American Library Association announced the 2009 Youth Media Award winners. There was much to be excited about, so much to celebrate. But I was most thrilled with the recipient of the John Steptoe Award, given by the Coretta Scott King Task Force. This award is given to affirm African American writers and illustrators new on the horizon, up-and-coming talent that may otherwise go unacknowledged within a given year. 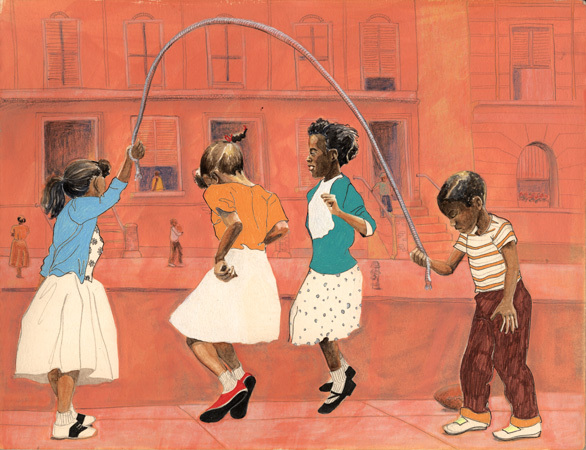 So often, in my opinion, because The African-American community is so small in relation to the larger publishing community, there are no surprises with the CSK’s. But The John Steptoe Award offers a surprise and introduces fresh new talent. It shines a light on a new author or illustrator and promises opportunities for the next generation. That’s why I’m so excited about Shadra Strickland. 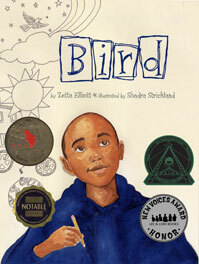 She is the 2009 John Steptoe Award winner for New Talent, for the book Bird, written by Zetta Elliott (Lee & Low Books). Shadra has masterfully crafted line and watercolor to produce an emotion-packed book. One of my favorite scenes is of young Mehkai, better known as Bird, as he imagines playing a saxophone, while jazz great Charlie Parker blows a tune. Don: How did you learn the news of your Coretta Scott King, John Steptoe award? Shadra: I got “the call” this morning [Jan. 26] at 8 AM. Robin Smith and the rest of the committee gave a warm CONGRATULATIONS and apology for waking me so early…not that I minded AT ALL. Don: How does it feel to win the John Steptoe New Voices Award? Shadra: I felt I had already “won” when I was asked to work on this very special book. Winning the John Steptoe Award is icing on the cake. To be the first woman awarded it are the sprinkles on top of the icing. Don: You did a fantastic job illustrating Bird. How did you become a part of this project? Shadra: Thank you. My editor, Jennifer Fox gave me my very first illustration job when I graduated from Syracuse. It was an emergent reader called, BIG OR LITTLE. I was living in Atlanta at the time. A few years later, after graduating from SVA’s M.F.A. program, I ran into Jen at The Society of Illustrator’s Original Book Art Show. Throughout the years I had continued to send her samples of my work and invited her to my thesis show at SVA. When we ran into one another at the Original Art show, it was kismet. She called and invited me to the office to show my portfolio the next day. After the meeting, she sent the manuscript. I said YES! It was absolutely perfect. Don: What drew you to the field of children’s publishing? Shadra: I love stories, and I love art. It seemed a very natural way to go for me. I started out wanting to be a designer at Syracuse but I studied illustration and writing on the side. After my first year of design, I switched my major solely to illustration. My passion lied in drawing and painting people. I would spend hours at bookstores pouring over picturebooks. I knew it was what I wanted to do. I moved back to Atlanta to teach for a bit before applying to SVA’s M.F.A. program. I chose as my advisor, Pat Cummings. Working with Pat was important to me because she was the only Af. Am. female illustrator I knew at the time who worked so steadily and with such imagination, and it was important to me to be around that energy…around someone whose work I respected and admired so much. While at SVA I interned at Philomel where I was able to see gorgeous live art come in for each magnificent project. Being at SVA with an amazing group of artists and meeting with editors and art directors for those two years was invaluable. After graduation I had many high hopes of getting my first book published and came close a couple of times, but it took almost a whole year after SVA before BIRD found me. It was worth the wait. In the meantime, I worked as an assistant for the amazing and talented Christopher Myers, finished my first Korean language picturebook, met my agent, and worked as a designer at BloomsburyUSA. Don: How would you describe your illustration style and technique? Shadra: My style…hmm, I try not to think about style too much. For BIRD, I spent days wandering around the city, taking pictures and drawing on location to try to exist in and understand Bird’s world. The more “real” images I collect, the easier it is for me to play when making the art. I like to combine very realistic elements and more whimsical ones. My favorite devices are pattern and line, but I am also a huge fan of delicious texture, and light. Honestly though, it all depends on the text. Zetta’s writing of BIRD was so straightforward and so graceful. I felt the art needed to be delicate and airy. I wanted people to be able to get in that story and live with Bird..to walk around in his shoes and feel what he felt. Don: Your illustrations are full with real life energy– who are the people in your work? Models, imagination? Shadra: I do shoot models for reference, but it’s important for me to work from the reference loosely. I am looking to capture specific emotions in the work and I find if I work too closely to the reference, the expression dies and gets caught up in the drafting. Granddad and Marcus were made-up. Though Granddad’s character is based on a man I saw sleeping on the subway one day. His hair was beautiful and snow white. I had to snap a pic of him with my cell. For Bird, I used my neighbor in Atlanta, and “Uncle Son” is my real-life uncle. All of the city elements were collected along the way. I spent a lot of time in Harlem shooting pics of clothes, shoes, buildings and people to be able to create a believable world for Bird to live in. I also watch a lot of movies for reference. For example, to create Marcus’s graffiti I watched Rock Fresh, by Danny Lee, a great documentary about the art of graffiti. Don: What’s on the horizon for you? Shadra: I just finished art for a new collaborative project with Bloomsbury USA called OUR CHILDREN CAN SOAR due out this April. I am working on two picturebook projects currently. I will also be working on another picturebook with Lee and Low next year. My goal is to author my own books and see what other spaces my art can “live” in. The John Steptoe award is such an honor…and such big shoes to fill. I just want to keep making beautiful books and keep getting better and better at being an artist. P.S. Shout out to my mom! Note: To clarify, the top image is from the book cover. Other images are from Shadra’s portfolio. She’s enormously talented AND humble! 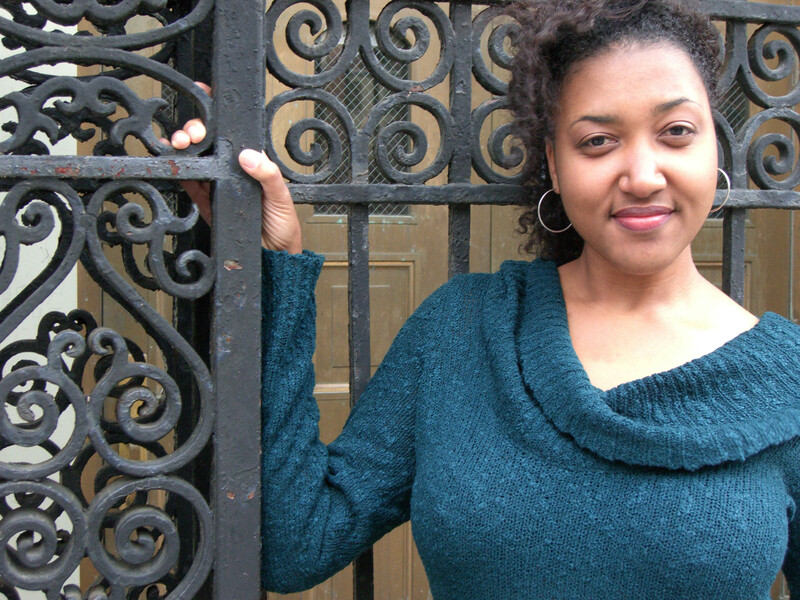 Here’s to Shadra’s continued success–may she blaze the trail for future black women illustrators. Shadra Strickland is such a talented artist, storyteller and she did a exquisite work for BIRD. I love her and love her work. Congratulations to her again and thanks for this great interview~! Wonderful interview! Congratulations, Shadra! Your work is beautiful. And I’m especially happy to learn you’re an SU alum too. Go SU :). Congratulations on a well-deserved honor. Bird was absolutely beautiful. Like what you all do here. Thanks for this showcase. Please stop by bes or Color Online. We’re currently hosting a Black History Month Writers’ Contest and giveaway. Would like to feature your group and you as individual writers and illustrators in the near future. Great interview! Shadra is going places! I’m so glad to have seen her work over time, getting more and more beautiful.